I was recently chosen by BzzAgent to review E45 body lotion, for those who have not heard of BzzAgent before, please do check the site out. It is a review site which chooses people based on their situations to review products on behalf of manufacturers and to write an honest review on Bzzagent and discuss with friends and family. There is no requirement to write up a blog post, you don't need to be a blogger to apply. My nan always swore by E45 cream, and because I thought my nana was the Oracle, whatever she used to use, I use! So I use E45 regularly on my son's cheeks when they are dry from the cold weather and it works wonders. We always have a tub in the house and I'm forever telling daddy to use it on his hands. 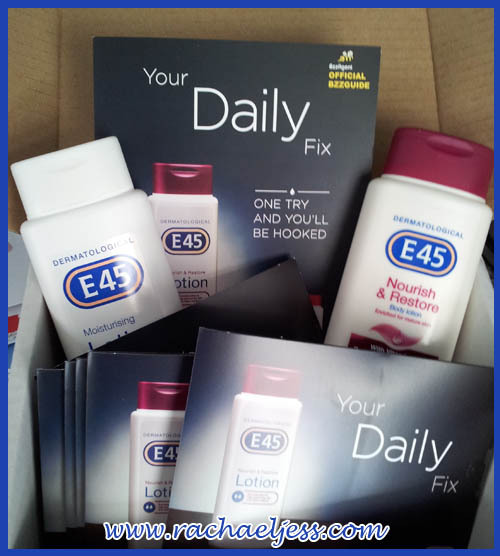 So when I received my bounty of E45 goodies I was quick to hand out all my samples to friends and colleagues and most had never used E45 cream before let alone body lotion. I must admit I've never used E45 as a body lotion (and didn't even know that it existed!) until recently. I love it! I've been using the E45 Moisturising Lotion for the past week and it does indeed leave my skin feeling smooth and that 'fresh out the bath' feeling - you need this with babies do you not? But you don't need to just take my word for it, you can now request a free sample from the E45 website so do come back and let me know if you agree with me. I am a BzzAgent and was sent these packets to review and report back to BzzAgent my findings and also let my friends and family know how I found the product.